Being from the Bay Area I have the opportunity to attend so many fantastic events and I get to meet amazing people along the way. About a year and a half ago while I was working on a TV assignment to cover the Café Tacvba show in Oakland, Rocky the General Manager from Union Rocker introduced me to Juan Manuel Caipo, one of the band members from a San Francisco band called Bang Data. 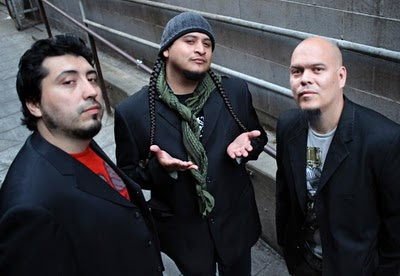 At the time I didn’t know about the band, other than the band members Caipo had been part of Orixa, Dave Lopez was with Flypside (one of my favorite bands when I was in college) and Deuce Eclipse was a well recognized Bay Area artist. Bang Data has been slowly but surely making its way into shows all over the Bay Area and establishing a great name for themselves. It was during one of the many shows I attended that I was able to catch a live set and I was blown away. Not every band (especially if they are an opening act) is able to get people’s full attention and get them to dance and get into party mode but Bang Data does that and more. Their shows are filled with different rhythms from hip-hop, reggae, cumbia & rock and that is what makes their fusion of sounds so unique. 2010 was quite a busy and successful year for the band 2011 is shaping up to be even busier. Bang Data is definitely a band you ought to know in 2011! Last night I had the chance to have a candid phone interview with Juan Manuel Caipo as he was heading to San Francisco. Check out my interview with Caipo and pay attention to find out of a surprise Caipo has exclusively for YOU my readers.